^ a b c La Rivière, Stephen (May 2013). Bradley, David (ed.). "Time Machine: Stingray". SFX. No. 233. Bath, UK: Future Publishing. pp. 76–77. ISSN 1749-6969. OCLC 813632043. ^ a b Bentley 2008, pp. 81–93. ^ Bentley 2001, pp. 11–12. ^ Hirsch, David; Hutchison, David (September 1978). Zimmerman, Howard (ed.). "The Magical Techniques of Movie & TV SFX – Part XI: Supermarionation". Starlog. Vol. 3 no. 16. New York City, New York: O'Quinn Studios. pp. 58–66. ^ Hearn, Marcus (September 2015). "Setting the Scene". In Hearn, Marcus (ed.). Thunderbirds – A Complete Guide to the Classic Series. Tunbridge Wells, UK: Panini UK. p. 63. ISBN 978-1-84653-212-2. ^ Rogers et al., pp. 84–85. ^ a b Clark, Anthony. 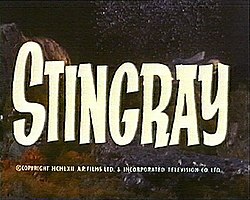 "Stingray (1964–65)". Screenonline. London, UK: British Film Institute. Archived from the original on 17 March 2018. Retrieved 23 February 2019. ^ a b c d Bentley 2008, pp. 354–355. ^ Cornell, Paul; Day, Martin; Topping, Keith (1996) . Marshall, Anne (ed.). The Guinness Book of Classic British TV (2nd ed.). London, UK: Guinness Publishing. p. 330. ISBN 978-0-85112-628-9. Bentley, Chris (2017). Hearn, Marcus (ed.). Captain Scarlet and the Mysterons: The Vault. Cambridge, UK: Signum Books. ISBN 978-0-995519-12-1.